Forty volunteers from the Sacramento office of Milgard® Windows & Doors worked hard to paint and refresh the Mustard Seed School for homeless children. Add a quotable“We are tremendously grateful to everyone at Milgard for their help,” said Casey Knittel, director of Mustard Seed School. “They fulfilled some dreams we have had for our school for a long time, but didn't have the resources to accomplish." Mustard Seed is a free, private school that provides a safe, nurturing and structured learning environment for homeless children ages 3 to 15 years old. Their focus is to provide a positive learning experience, happy memories, and support their students with resources for food, clothing, shelter and counseling so they can strive to reenter the public school system. 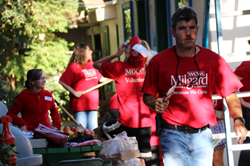 The Milgard Sacramento Matching Gift/Community Action Team (MG/CAT) brought together forty volunteers that included Milgard employees, family members and friends. They met at 7am on a Saturday and worked all day to beautify the Mustard Seed elementary school. The Mustard Seed School was established in 1989 and has helped over 4,500 children.